Johnny came up this week to do a two day workshop with us, whatever we produced we could continue as the personal project. I wasn't actually able to make this workshop but then plans changed and I really wanted to do it. I am glad I did it now. Johnny is such an honest, easy to talk to designer that really pushes you to think creatively. He has had a lot of experience and this shows through clearly, with this brief he has ran it many times, so us expectations were high! The brief: object/react was based on Museums and how objects like artifacts don't communicate to us or allow us to interact with them. How can we change this? How can you make them speak and be experienced? He wanted us to choose an object within Manchester Museum, understand it, learn the history thus allowing me to design an idea that would allow the object to speak/communicate with us in society today. The problem with Museums is that the objects are housed in cases, mainly to preserve them but in doing this they become distance and static moments in time. Also, many museums don't allow viewers to touch or experience artifacts so it is a challenging brief as this is a major problem now. I chose two objects: some 2,000 year old buttons and Solnhofen fossils. 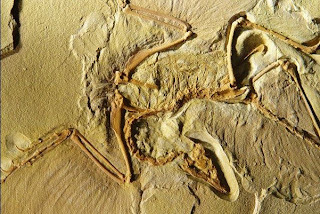 After speaking to Johnny, he thought that the fossils had more potential as they are a dying artifact that most people don't appreciate, or rather know! So I went back to the fossil section, did more research and began to understand them, I had to understand and connect with why they were not interactive or engaging? Solnhofen Fossils- the limestone preserves the animals to a high detail due to the conditions. Fossils are the remains and imprints of past life preserved in rock, revealing what lived at that time. But because we don't know whether they actually lived or not, what they were, we do not connect with them. As humans, we need to make sense of things in our world before we can make a connection. Taking this on board, I came away and began to look at how to make fossils alive in the 21st century. What would contemporary fossils look like? What would we fossilise in 2009...a car...a laptop...what? What would document now? The ideas I came up with were based on the elements of original fossils, (preserving objects in rock) but with a twist! Taking materials of today e.g. plastic, metal, wood and brick what would these look like in 1,000 years time? As different materials deteriorate at different rates, it would a visual representation of how things survive. I also wanted to make the interaction of the museum, come out of the museum...so, having fossils in Manchester city centre would not only get them noticed but would intrigue people. An example of my idea is: take a human skeleton, imagine they have had plastic surgery e.g. breast implants. Not only does this document the trends of present day but would would it look like to people in another 1,000 years...I can't even imagine what technology would be like then, so how would they interpret it?? Johnny seemed pleased with my response and the outcome so far. Obviously there are many objects that I could fossilise today, so he said a few more ideas would be appropriate. But generally a well done! I surprisingly liked the workshop, mainly because of Johnny's contribution and attitude, but it was fun and did make me think of time management and how quickly I can create ideas.